Happy Mothers Day to all mothers in the UK, I spent the day with my mother, we went to Skipton and stopped off at Embssay Mills for a bit of lunch and a look around. I have been working on finishing this, my mother gave me it, I have finished the stitching just need to put it together doesn't look easy! Just noticed not stitched the spades to go with the buckets, as there is a stitch missing on the bottom line. Nearly there just need to make a twisted cord and finish the top. 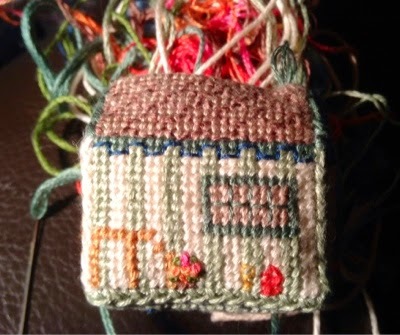 The post below can also be included in this SAL as I received the below ornament as a gift in the HOE Sheep exchange I still cannot share what I stitched yet as it has not been received in the post yet, so next month I will share it. Mothers day is early in the UK. How nice You got to spend it with yours. You mom looks pretty. That is a beautiful stitched piece. Your mother is such a pretty lady! 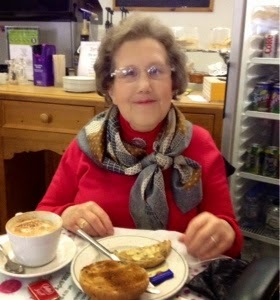 It is good that you are able to spend time with her, especially on Mother's Day. I miss my mother and being able to call her and when able travel down to my home town(two-and-a-half hours)to visit her as she has passed away some years back. The little house piece is so sweet! I love tiny houses and this one is very nice! Enjoy a beautiful week ahead! Love the little house and very neatly done. Glad you enjoyed your Mother's day outing. 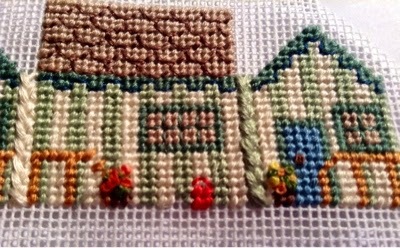 What a lovely piece you are stitching!! I hope we get to see pictures of it finished!! So glad you could spend Mother's Day with your Mom, it sounds like you had a lovely day! How nice that you got to spend the day with your Mom. 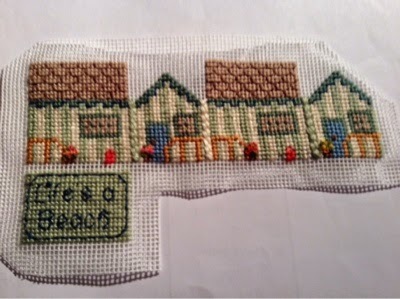 Putting that beautifully stitched house together looks a bit challenging! Thank for taking part in GG this month. Glad you had had a nice day with your Mum. The little house is so cute and tiny! I have a 3D project but it's a little bit bigger than that. Your little house looks charming. Good luck with the assembly.